October Co-op Month Breakfast was a hit! 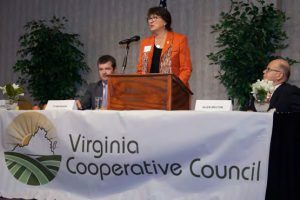 The VCC October Month Breakfast was a hit with more than 70 members and supporters of the Virginia Cooperative Council, including representatives from the electric cooperatives, purchasing/supplier cooperatives, Farm Credit and others. The breakfast was held in Glen Allen on October 9th to celebrate National Co-op Month. Launched in 1948 to increase public awareness of our nation’s diverse cooperatives, this year’s Co-op Month theme is “See the Future”. The keynote speaker was Bettina Ring, Virginia Secretary of Agriculture and Forestry. In her address, Secretary Ring explained that agriculture and forestry are the Commonwealth’s first- and third-largest industries, providing more than 450,000 jobs and garnering $91 billion in annual revenue. She added that agritourism is becoming increasingly popular, contributing to the Commonwealth’s second largest industry of tourism. You can see a full article about the event in the VCC Fall Newsletter.